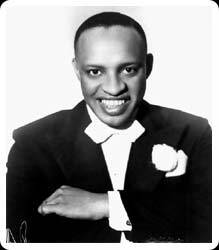 Lionel Hampton is one of the most extraordinary musicians of the 20th century and his artistic achievements symbolize the impact that jazz music has had on our culture in the 21st century. He was born April 20, 1908 in Louisville, Kentucky. His father, Charles Hampton, a promising pianist and singer, was reported missing and later declared killed in World War I. Lionel and his mother, Gertrude, first moved to Birmingham, Alabama, to be with her family, then settled in Chicago. He attended the Holy Rosary Academy, near Kenosha, Wisconsin, where a Dominican sister give him his first drum lessons. Later, while attending St. Monica’s School in Chicago, Lionel got a job selling papers in order to join the Chicago Defender’s Newsboys Band. At first, he helped carry the bass drum, and later played the snare drum. While in high school, Les Hite gave Lionel a job in a teenage band. Later, the 15-year-old Lionel, who had just graduated from high school, promised his grandmother he would continue to say his daily prayers and left for Los Angeles to join Reb Spikes’s Sharps and Flats. He also played with Paul Howard’s Quality Serenaders and a new band organized by Hite, which backed Louis Armstrong at the Cotton Club. When Benny Goodman heard him play, Goodman immediately asked Hampton to record with him, Gene Krupa on drums and Teddy Wilson on piano. The Benny Goodman Quartet recorded the jazz classics “Dinah,” “Moonglow,” “My Last Affair,” and “Exactly Like You.” Hampton’s addition to the groups also marked the breaking of the color barrier; the Benny Goodman Quartet was the first racially integrated group of jazz musicians. Hampton and his wife, Gladys, were married Nov. 11, 1936. Gladys served as his personal manager, and developed a reputation as a brilliant businesswoman. She was responsible for raising the money for Lionel to start his own band. 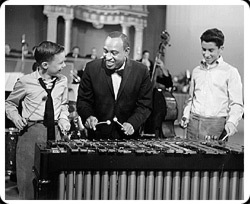 As a bandleader, he established the Lionel Hampton Orchestra that became known around the world for its tremendous energy and dazzling showmanship. “Sunny Side of the Street,” “Central Avenue Breakdown” (his signature tune), “Flying Home,” and “Hamp’s Boogie-Woogie” all became top-of-the-chart best-sellers upon release. The name Lionel Hampton became world famous overnight, and the Lionel Hampton Orchestra had a phenomenal array of sidemen. The band also initiated the first phase of Hampton’s career as an educator by graduating such talents as Illinois Jacquet, Cat Anderson, Dexter Gordon, Art Farmer, Clifford Brown, Fats Navarro, Clark Terry, Quincy Jones, Charles Mingus, Wes Montgomery, and singers Joe Williams, Dinah Washington, Betty Carter and Aretha Franklin. The Lionel Hampton Orchestra became known around the world for its first-class jazz musicianship. As a statesman, he was asked by President Eisenhower to serve as a goodwill ambassador for the United States, and his band made many tours to Europe, Africa, the Middle East, and the Far East, generating a huge international following. President George Bush appointed him to the Board of the Kennedy Center, and President Clinton awarded him the National Medal of the Arts. In his continuing role as an educator, he began working with the University of Idaho in the early 1980s to establish his dream for the future of music education. In 1985, the University named its jazz festival for him, and in 1987 the University’s music school was named the Lionel Hampton School of Music. The Lionel Hampton International Jazz Festival, The Lionel Hampton School of Music, and the International Jazz Collections archives of the UI Library are all designed to help teach and preserve the heritage of jazz. 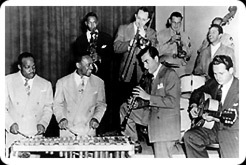 Front row: Count Basie, Lionel Hampton, Artie Shaw, Les Paul. Back row: Illinois Jacquet, Tommy Dorsey, Ziggy Elman, Buddy Rich on drums, bassist unknown. 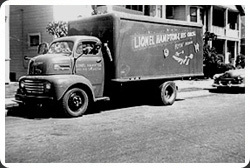 “Lionel Hampton and his Orchestra” truck. 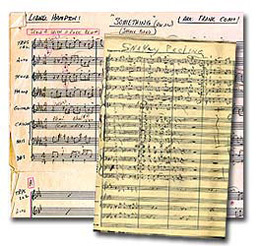 Hand written scores from the Lionel Hampton Collection in the UI International Jazz Collections of the UI Library. 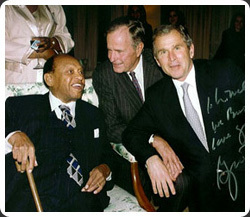 Lionel Hampton with former President George Bush and President George W. Bush. 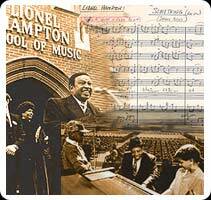 The Lionel Hampton School of Music is the only music school named for a jazz musician.